A cooking challenge organized by Meg of Grow and Resist and Briggs of Oh Briggsy in which we explore a featured cookbook each month. The selection for November is The Dahlia Bakery Cookbook by Tom Douglas and Shelley Lance. 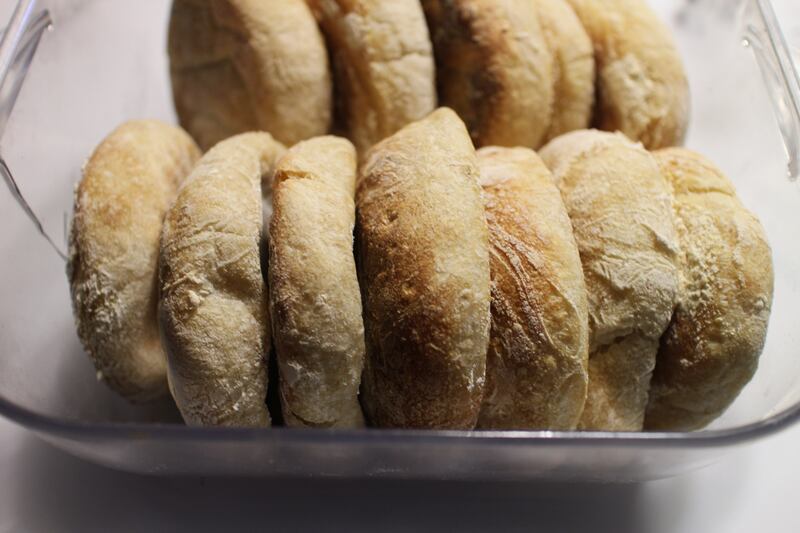 Dahlia had me at the English muffins. And the sandwiches made with them. It was — all over again — the “Beef on Weck” moment from the months’ earlier review of the Mile End Cookbook, sandwiches that resurrect the memory of indulgent comfort food of times past. For me, it’s not the sweets that inspire, but the savories. That’s where I started. Of course, with Thanksgiving pies to make, I ended in a sweet spot. My first reaction to the choice of the Dahlia Bakery Cookbook for November’s book review was a big “uh oh.” We have a mostly wheat-free household and a couple of family members who are of necessity hands-off gluten, the GFs as we affectionately call them, one of whom cannot tolerate dairy either. Can you imagine full regalia Thanksgiving without gluten and dairy? We’ve been able to pull this off, but this year, the GFs are in Africa during this weekend (not joking about the ridiculous line to young picky eaters that we’ll send the food to starving Africans – they do serious good there). It was a “Ma’s out, Pa’s out, let’s talk dirt” opportunity for the gluten cravers. For me, it was also a good warm-up for several upcoming adventures cooking for crowds. I did make the Dahlia Bakery English Muffins (pages 51-55) with great success, although I couldn’t get the dough to the temperature expected after beating it in the stand mixer. 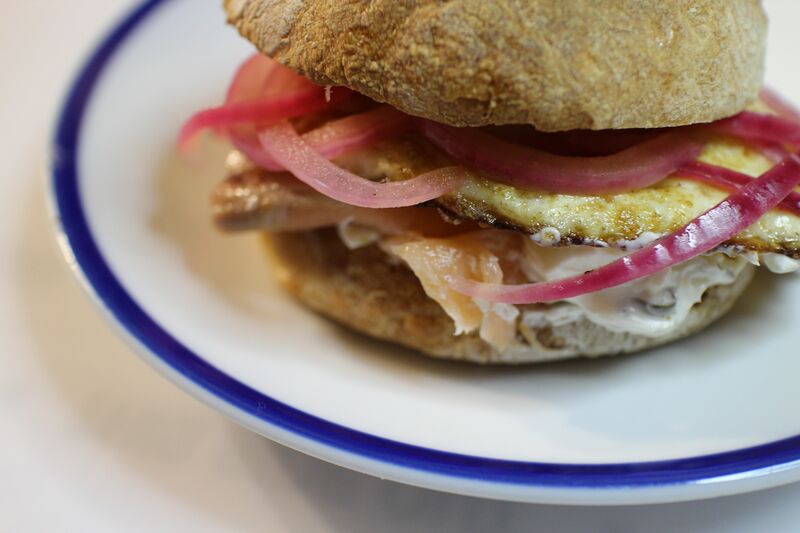 We had a spectacular “Seattle” Sandwich with Cured Wild Salmon (pages 39-41) with the proceeds. 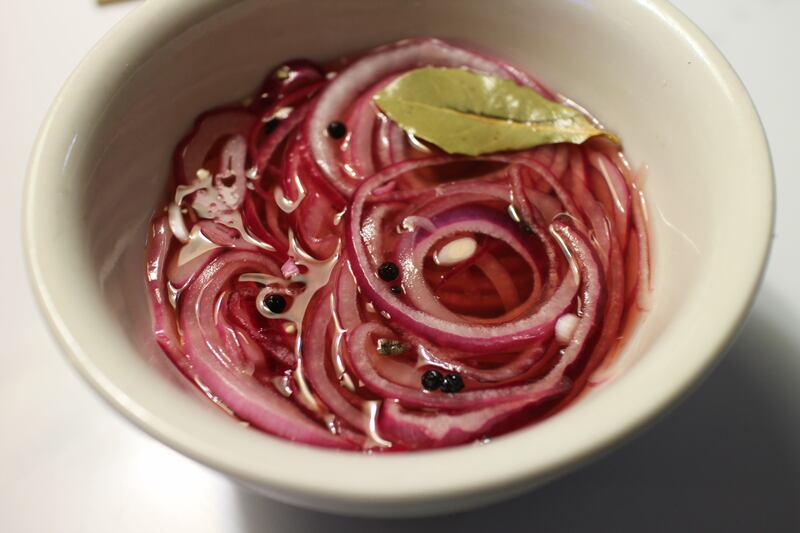 I especially appreciated the Pickled Onions (page 39), a quick dunk of sliced red onions in red wine and sugar spiked with cardamom, black pepper and bay leaves. Brilliant. Bread pudding, or strata, as it’s sometimes called when made with savory ingredients, is a standby around here, my husband’s meal of choice. Before we were mostly gluten-free, it was a great make-ahead brunch dish for holidays, much as it sounds like a Douglas family tradition. 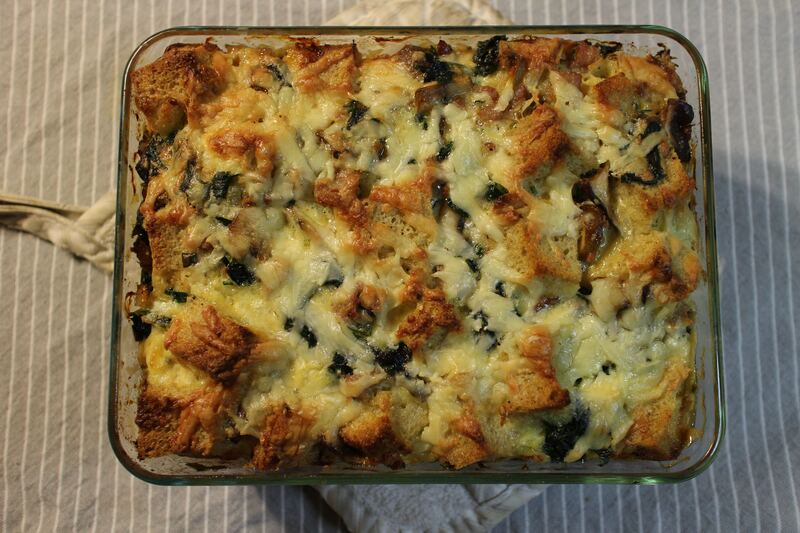 I made Jackie’s Favorite Strata with Wild Mushrooms, Sausage and Chard (Pages 117-119) with an excellent rustic sourdough from our rock star local bakery, and was lucky that I heeded the recipe’s caution of comparing volume and weight. If I’d gone by weight, it would have been too dense. The strata was denser than it might have been, especially considering that I halved the ingredients and “rounded up” the cream/milk and eggs. I normally would use mostly milk and just a little cream so I diluted the called-for heavy cream with milk. Too rich for me! With the sausage and butter and volume of cheese in the dish, it packed a hefty amount of calories and high count of fat and starch. Nonetheless, it was delicious, for Saturday night supper and even better heated up the next day. My husband raved. He ate it three days in a row. 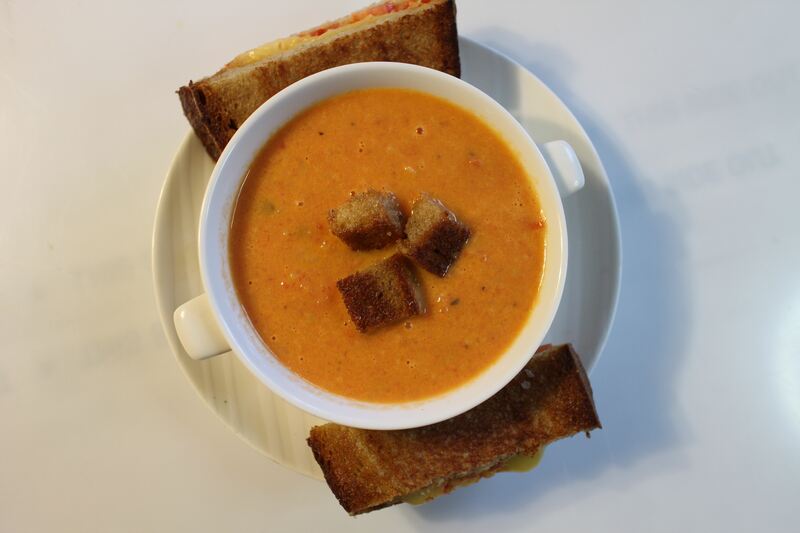 A typical weekend routine around here will have us brewing soup from whatever’s in season and bountiful, as well as making sandwiches on the fly, many of which end up being grilled cheese in one combination or another. I had SO many tomatoes that I hadn’t canned, mostly because I’ve been traveling, and therefore Tom’s Tasty Tomato Soup with Brown Butter Croutons (Pages 342-343) caught my eye. Given my lack of sweet tooth, it’s logical that I would seek out the least sweet treats from the book. I used fresh tomatoes instead of canned and therefore adjusted the sequence a little, cooking the tomatoes to reduce them before adding the cream. Like just about every other recipe in the book, I cut the cream in half, and it was still too much for our taste. Nonetheless, the addition of celery seed, fresh oregano and minced dried red pepper flakes made a perfect balance that I might not have thought of. I prefer olive oil croutons but the browned butter worked well with the soup. And of course, Grilled Cheese with Heirloom Tomato (Page 345) was a welcome accompaniment. 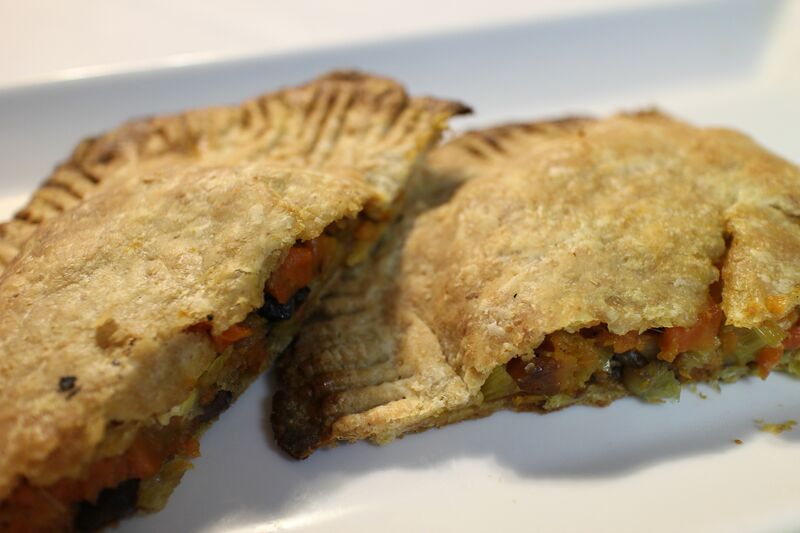 Roasted Carrot, Leek and Goat Cheese Hand Pies (Pages 212-214), made with Whole Wheat Pastry Dough (Page 215) were fantastic. I used to make vegetable crostata and hand pies with cabbage and mushrooms but was unhappy with the pastry dough, so I ended up making the fillings on their own as side dishes. I thought to myself that roasted carrots and leeks would make a pretty good combo, even if we didn’t like the pastry. Nuh huh. This was awesome whole wheat pastry, flaky, crispy and not like the typical cardboard consistency of many whole wheat products. I attribute this to: lots of butter, sour cream, and the combination of whole wheat pastry flour and regular flour. 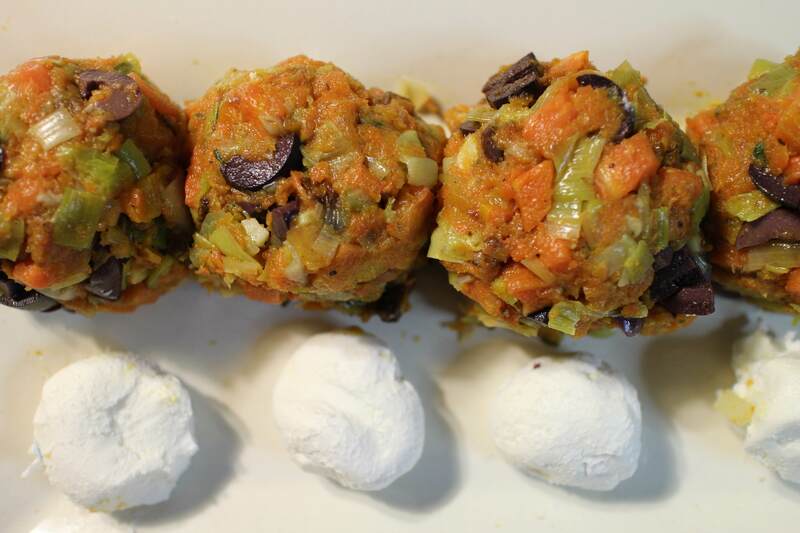 The filling, made with roasted diced carrots and leeks mixed with mashed roasted carrots, goat cheese and kalamata olives, was perfect. 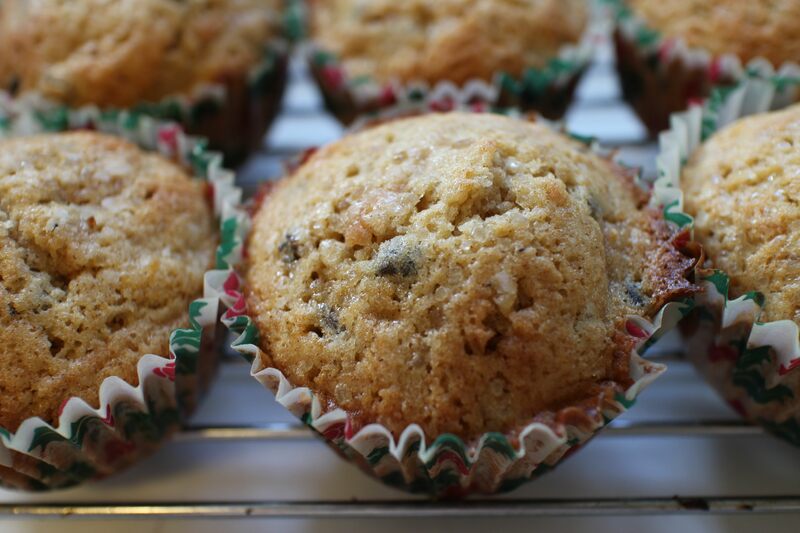 I can always use another muffin recipe and was intrigued by Carrot Muffins with Brown Butter and Currants (page 75). I usually find carrot cake too dense and thought that the smaller proportion of carrots in this batter, accompanied by grated orange zest and plenty of vanilla extract, would make a good muffin. Definitely. I especially liked the coarse sugar and salt topping. The ones I baked directly in the muffin tin, versus in paper liners, were crunchier and a wee bit more satisfying. I use paper muffin cups only when taking baked goods on the road. Finally, the pies, the crown jewels of the Thanksgiving groaning board. 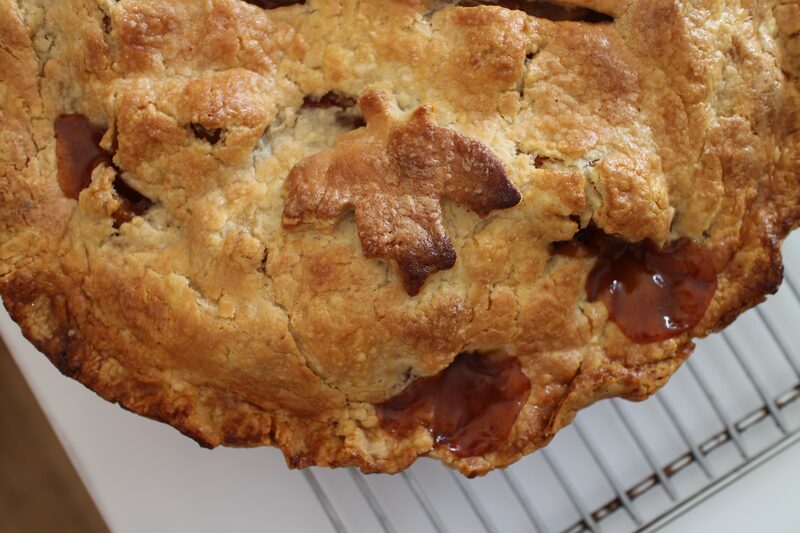 I’ve been searching for the perfect over-the-top apple pie for a couple of years, so I tried “Hot Buttered Rum” Apple Pie (pages 199-201) made with Flaky but Tender Pastry Dough (pages 183-185). That was scary. This pie bakes for two hours and features a soft-flour (pastry or cake flour) crust. It looked just terrible when it came out of the oven. The high flutes of the edges dropped off and it bubbled to the bottom of the pan. I rarely have kitchen failures and would have baked another pie if the turkey weren’t begging to go into the oven. Well, I needn’t have been so worried. Once it cooled, hours later, this turned out to be a completely delicious pie. Everyone raved about the apple filling and the crust was what the recipe said, tender and flaky. Next time, I’ll try a slightly more robust flour and will not shape the edges. 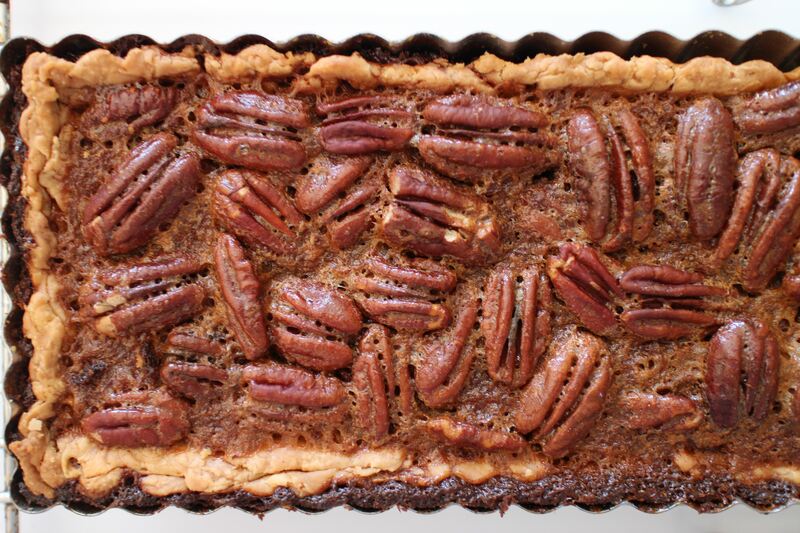 Finally, there was Kentucky Bourbon Pecan Pie (pages197-198), baked in a rectangular tart pan. I halved the recipe for the filling and used sturdier dough for the shell since I wanted it to stand up outside the pan. This too was delicious. Now I’m looking forward to the Christmas season and have already started marking the cookies and cakes I want to make from this cookbook. It’s a winner.